Kak Ibrahim farming on his land that haven't been burned. Kak Ibrahim was digging around his cucumbers and tomatoes plots when CPT visited his village of Barbazin, in the sub-district of Sidikan, on 15 August 2018. He picked a bunch of cucumbers and gave them to team members. Nearby, green tomatoes hung on rows of plants. A few wild flowers peaked through surrounding grasses and weeds. Peaches, that would get ripe by October, filled the branches of the trees—all examples of the bounty of the farming villages in the mountains of Iraqi Kurdistan. The unusual thing here, however, was that these productive patches were surrounded by burned fields and hillsides. The explosions of Iranian military shells, fired midday in July from bases along the Iran-Iraq border, just over the mountain east of the village, set the dried grasses on fire. Kak Ibrahim described the three hours of bombardment as “rockets heavily raining down on us.” Farmers in the village unsuccessfully tried to put out the fires by beating them with tree branches. The fires spread and burned vast areas within and around the village of Barbazin. They burned Kak Ibrahim’s grape vines, but left some of the small patches of cultivated plots of vegetables and groves of fruit trees that had little grass in them. 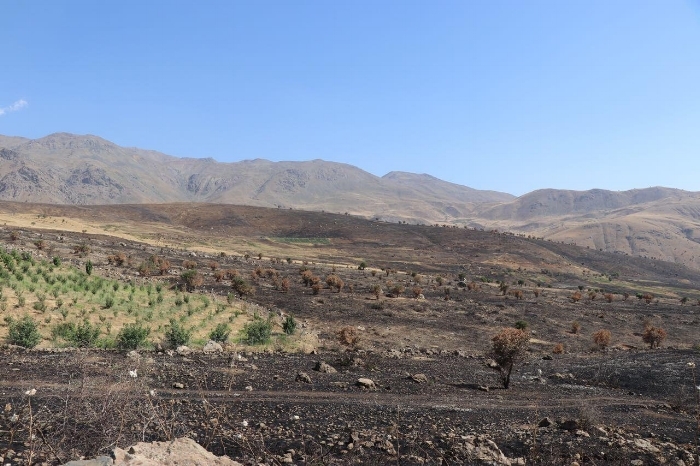 CPT first came to Barbazin in July 2016, just after the Iranian military had shelled the village, leaving the grass and most of the crops in the village and surrounding hills burned. Kak Ibrahim’s son, Rashad, met the team then and had since then called the team several times to report more bombardments. Twenty to twenty-five families farmed the land before the periodic attacks started two years ago, but many have left out of fear and frustration. Now only four families work the land during the growing season. Kak Ibrahim and his family no longer reside here, but come for days at a time to tend their fields since this is an important part of their income. He said that there were no injuries or buildings damaged from the July attacks, but the farmers with cattle depended on the grasses for grazing. The owner of the cattle currently on a nearby hill, told him that he could no longer risk his family’s safety being there and felt forced to sell his cattle. Burned farm land around the Barbazin Village. Kak Ibrahim pointed to a hill to the north of the border and said, “We are in between. From that hill, north, Turkey bombs. From here, south, Iran shells.” He explained that it depended on which armed actors, frequented these areas, Turkey feeling threatened by the Kurdistan Workers Party (PKK), an armed resistance group, and Iran, by the Kurdistan Democratic Party of Iran (KDPI), an Iranian armed resistance group. But it’s the civilians in the area, the farmers and shepherds, who suffer the most. He estimated that farmers in his village have lost about $40,000 in income because of the sporadic bombardments. He said the Iranian military does not differentiate between Kurdish civilians and members of Kurdish militias. “They just see us all as Kurds and want to push us out of this area.” He would like the U.S. and European “superpowers” to put pressure on Turkey and Iran to stop the attacks. As the team left, Kak Ibrahim took his shovel and continued to work around the cucumber patch. The next day family members planned to come out and harvest them and then take them to the city of Hawler to sell. They seemed well aware of the dangers, but choose to take the risks and not be driven off the land and lose their traditional way of life.